A search bar that allows you to find cPanel features quickly. Just start typing to bring up your desired tool/application. 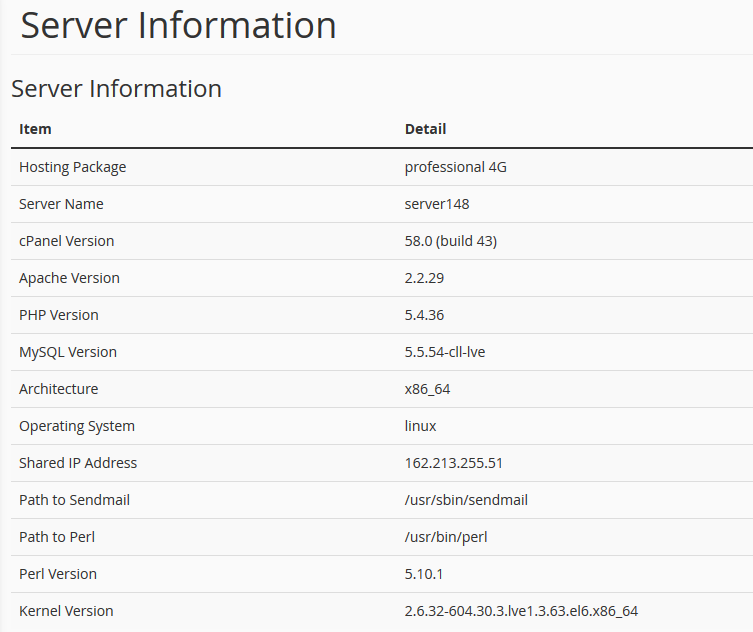 If you click Server Information you will find more detail about your hosting package. File Manager: here you can manage the files stored inside your account. Directory Privacy: allows you to password protect your website/certain folders. Disk Space Usage: reveals detailed information about your resource usage. FTP Accounts: this option allows you to create and manage FTP accounts – which will let access your server and upload/download files. FTP Connections: reveals who is currently logged into your site via FTP. Backup Wizard: is a user-friendly interface for creating backups of your site. Inodes Usage: provides statistics on your accounts inodes (files) usage. 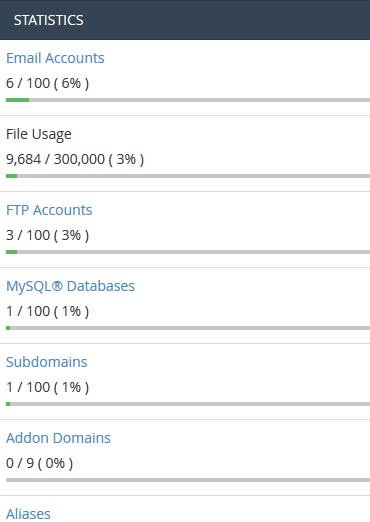 phpMyAdmin: is a database management tool. It is super useful and allows you to make direct changes to your MySQL tables/databases. MySQL Databases: will allow you to create and manage MySQL databases inside cPanel. MySQL Databases Wizard: provides the same functionality as above, however creates a 3-step user friendly process. PostgreSQL Databases Wizard: has the same functionality as PostgreSQL Databases (above) but displays the process in a user-friendly way. phpPgAdmin: is a database management tool, that allows you to make chages to your PostgreSQL databases. Email Accounts: in this application, you can create and manage mailboxes associated with your domain name. Forwarders: allow you to forward emails to another address. E.g. hello@yourdomain.com can be redirected to your personal inbox. – Perfect if you want to use a vanity business email address, but wish to continue to use your private email address for correspondence. MX Entry: allows you to setup and modify your MX records. Autoresponder: allows for automatic messages to be dispatched. (E.g. a “sorry this inbox isn’t checked” autoresponder would be good for a noreply@yourdomain.com email address). Mailing Lists: with this option you can create a single address to send emails, newsletters and other updates to multiple email addresses simultaneously. Track Delivery: allows you to track routing of email messages. 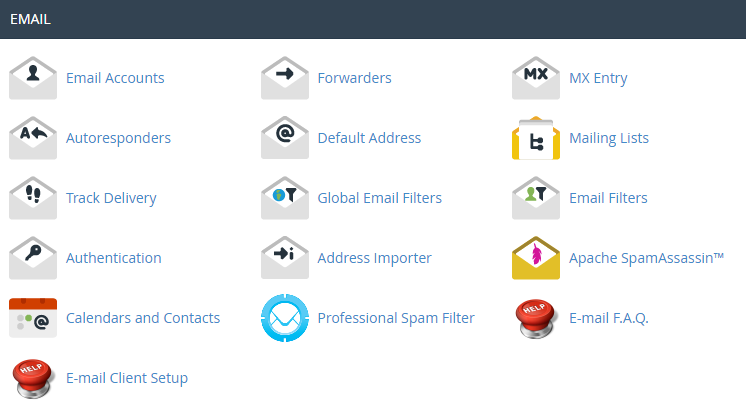 Global Email Filters: will allow you to setup email filters for all addresses on your domain. Email Filters: will do the same as above, but for one account (opposed to every address on the domain). Authentication: is a tool that helps prevent spam. This is done by setting up a DKIM and SPF record. Addon Domains: with the help of this application, you can add more domains to your hosting account. Aliases: this will let you ‘park’ additional domain names on your existing hosting account. They will display the same website as your primary domain and share web statistics as well. Redirects: here you can create redirects for specific domains/pages to other domains/pages and display the contents of the latter. Simple Zone Editor: will allow you to edit basic DNS settings such as A and CNAME records. Advanced Zone Editor: allows you to edit all DNS settings such as A, CNAME, SRV and TXT records. Visitors: provides a log of all the visitors who have been on your website. Errors: will reveal the last 300 errors that users encountered on your website. Bandwidth: provides an accurate picture of the bandwidth used by visitors on your website. Raw Access Logs: provides a RAW access log for everything that has happened on your account. AWStats: shows a detailed breakdown of the visitors who have been on your website, where they’re from, and how they got to your domain. SSH Access: allows you to generate an access key for your account to be edited/viewed via. SSH. IP Blocker: provides you a way to block certain visitors from accessing your website. SSL/TLS: will run you through setting up a SSL certificate on your domain – crucial for e-commerce websites. Hotlink Protection: allows you to enable hotlinking protection. (Preventing people from directly linking of your images and consuming your hosting account bandwidth). Leech Protect: allows you to control whether or not users can give out or publicly post their passwords for restricted areas of your site. It can be used to redirect compromised accounts to a URL of your choice (e.g. a suspended page). Select PHP Version: here you can change your websites PHP version. PHP: let’s you check your PHP configuration settings. PHP PEAR Packages: allows you to install and maintain any PHP PEAR packages on your account. Perl Modules: provides management over Perl modules available on your account. RubyGems: will display a list of functions which allow tasks to be performed inside Ruby. Cron Jobs: will allow you to schedule scripts to run at a specific time. Track DNS: provides DNS information while providing trace route information. Indexes: allow you to customize the way visitors view a directory on the web. Error Pages: allow you to edit the code for the default errors pages. Apache Handlers: lets you modify Apache handlers for different file types. MIME Types: provides you with information on the systems predefined MIME types. Virus Scanner: will scan your entire cPanel account for viruses. Change Password: will allow you to edit/modify the password you login to cPanel with. Change Language: lets you change the default cPanel language. 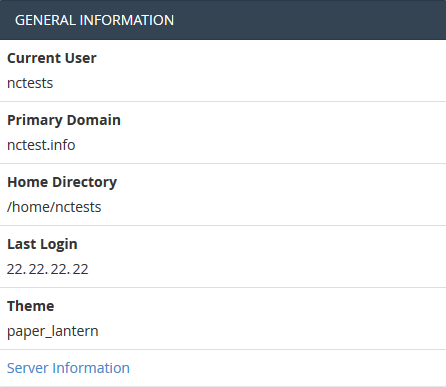 Change style: here you can change the overall look and feel of cPanel. Contact Information: allows you to add your email address to receive updates on system information.